This is a Mechanical final year project on "design of multi cavity injection mould for “multi-insertable jar cap". In this project an attempt has been made to design of an injection mould product and mould for “multi-insertable jar Cap”. The main consideration of the product is to analyze the product design, mould design and selection of suitable plastic material for selected product. The estimation of the mould, to access the approximate mould cost of this product and also analyzes the actual addition of shrinkage value. Above image shows flow chart for methodical designing of injection moulds. The material which has been chosen for the product is HDPE which is excellent insulation property & chemical resistance compare to other plastic material. This material is very perfect to make like this component than any other material. This material is expensive than other thermoplastics. The injection mould consists of two main parts – core and cavity. It helps in getting the desired shape of the component. The material gets the shape of the space between the core and cavity – impression. 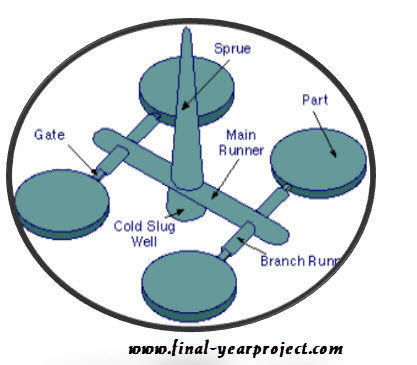 The material reaches to the impression through the feed system – sprue , runner and gate. Automatic degating is also possible. The components are ejected by the various ejector elements. To freeze the component quickly cooling is provided in both sides of the mould. This project is one of the great resource for building project on injection moulding and its application are powering many industries in business. Use this for your reference and study work.